This post is part 3 in a 3 part series on building your own server inventory system using PowerShell. In this article, I am wrapping up my 3 part series on building a server inventory system using PowerShell and SQL. Over the course of the last articles, I have show you how to build the databases and tables required to store server information and then began the actual data collection and sending it to the SQL server for later review. Now I am going to take you through the process of building out and using the server inventory user interface made from PowerShell and XAML. I won’t show off every line of code as it will be rather large, but will take you through some key areas that I think are interesting. Before I go deep into the code, I wanted to lay out some of the requirements that I had when designing this UI to make it as usable as possible for folks other than just me. There may be a few more things that I have left out, but these cover most of the main items that I wanted to have on this UI. I build the front end UI using XAML and stepping through all of the controls in order to get the right look. If you look at the XAML code, you may notice that there are a lot of missing things in it such as Tabs and DataGrid for each tab. 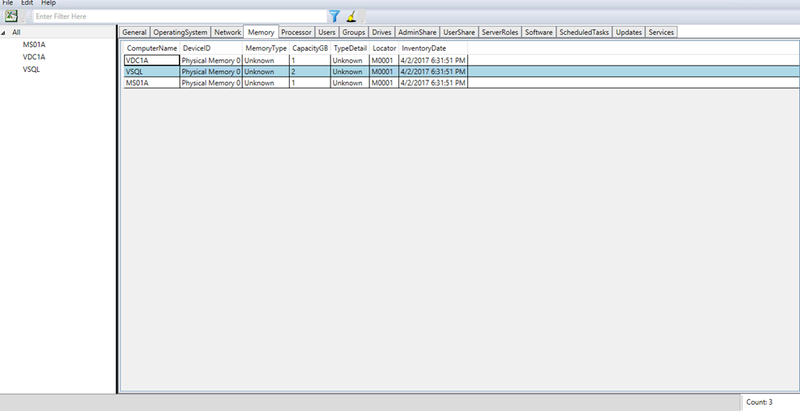 This is because I need to dynamically create them later on when I begin making the connection to the SQL server. This is really the only area that you should have to make and updates to the code. Defining the SQL server that you will be connecting to and then defining the table names that exist on the database which will help in building out more of the UI controls. Having a UI that does things is only as good as the help which you provide. That being the case, I wanted to have a small help window that would highlight a few things that the user might need to know such as keyboard shortcuts and some Filter definitions. For some of my buttons, such as the Excel report, I wanted to show more than just a dull grey button and instead looked at grabbing some images from the icons which would represent best the way that the button was being used. I could then use that string and supply it to the button as a BitmapImage. 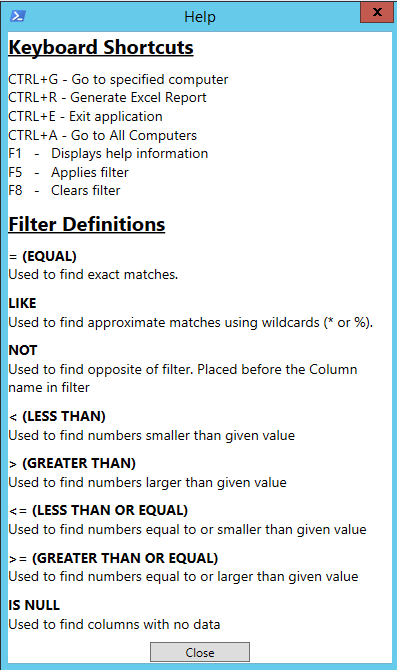 In my planning, I didn’t think that I would have more than 26 (A-Z) columns in my Excel report for an given column. When my reports started to show blank data, I started my investigation and found that my UI columns were more than 26 and would then go into the AA, AB, etc… column labels in Excel which I hadn’t accounted for. 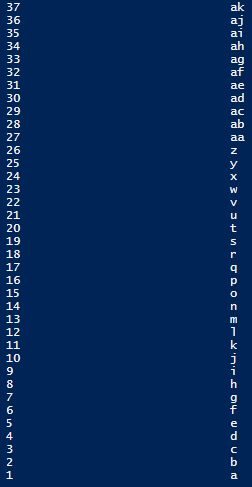 I ended up making some changes in how I created the Column letter to Number hash table by accounting for numbers greater than 26. I won’t show all of the code as it is over 200 lines but will show you the first few lines that show off the builds of some of the controls. Write-Verbose "Running Window Loaded Event"
$UIHash["$($Table)_datagrid"] = New-DataGrid -Tab $Tab -Name "$($Table)_datagrid"
$UIHash["AddToFilter_Equal_$($Table)_menu"] = New-MenuItem -Name "AddToFilter_Equal_$($Table)_menu" -Header "Add to Filter (EQUAL)"
$UIHash.Filter_txtbx.Text = "$ColumnName = '$Value'"
This leads into the building of the context menus to help with filtering our data on each DataGrid. I added this feature so an everyday user would just right click on an item and pick the type of filtering criteria to use. Subsequent filtering approaches would be either an AND or an OR to ensure the proper type of filtering takes place as shown in the GIF below. While it is nice to have a UI that you can work with, other times you might want to have a report that can be sent via email or printed out. 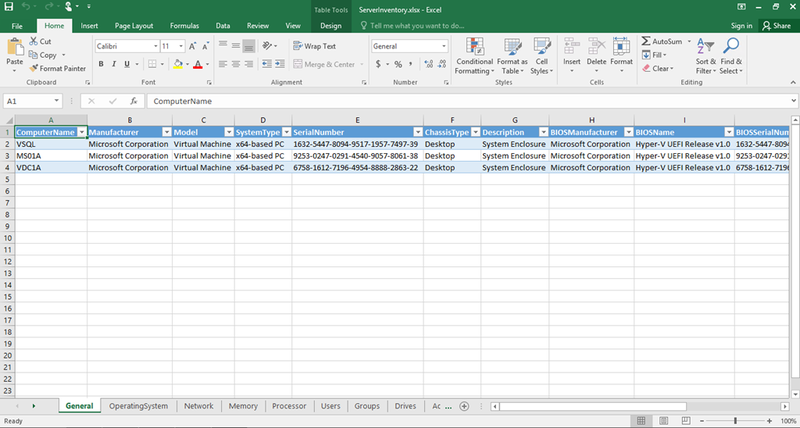 By clicking on the Excel icon at the upper left hand side, you are treated to some options on what kind of data you want on the report by picking the tabs that will be available on the excel workbook. Keep in mind that any filters which are in place will for the display will be brought into the report. If you are picking any other system from the tree view on the left, then only that system will be included in the report so it is recommended that you select All prior to generating a report. The results is a great Excel report to use as you need. $message = "The report has been saved to: $ReportLocation"
$uiHash.status_txt.text = "Generating Report: $(($Table).SubString(2))"
There are many other areas that I could highlight, but that may have to be another time. In the meantime, head on out to the GitHub page (listed below) for my ServerInventory project and let me know what you think! As always, if you want to contribute to this project, just fork the repo over to your page, make some updates and submit a Pull Request. 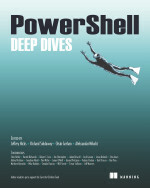 This entry was posted in powershell and tagged inventory, Powershell, server, tsql, UI, WPF, xaml. Bookmark the permalink.